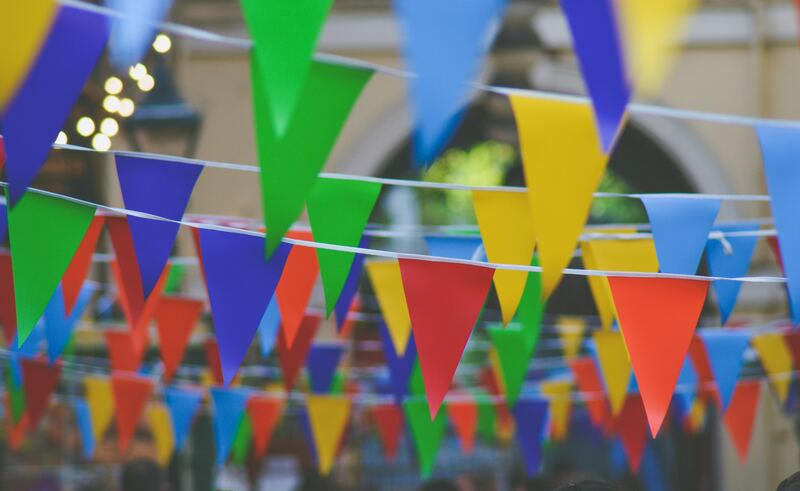 Sciblogs | A Pox on all their Parties! A Pox on all their Parties! 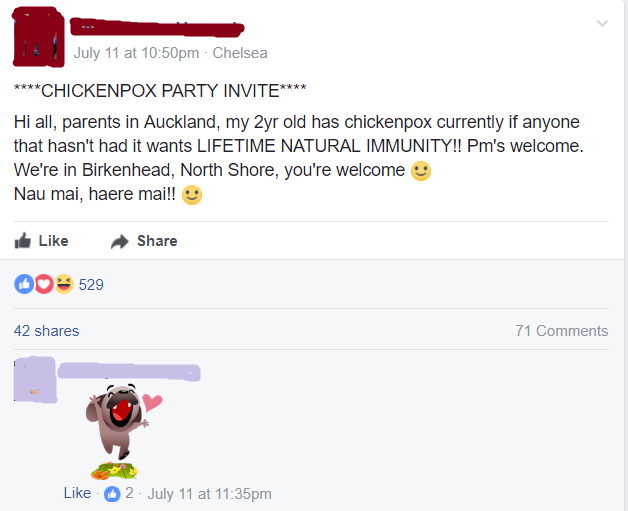 Chickenpox “parties”. They had their day – and that day was before the chickenpox vaccine came on the scene. Because chickenpox can be much worse in teens and adults, back in the day it did make sense to contract the disease in early childhood. In fact, it was almost unavoidable, given the epidemic nature of this virus. 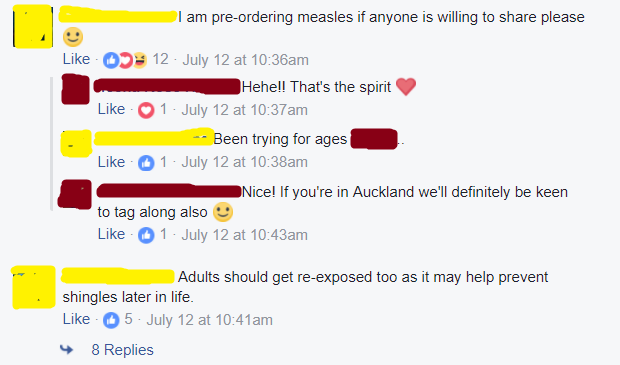 But a vaccine is now available, so we’ve moved on, right? They could not be more wrong. Shingles is caused by the same virus that causes chickenpox. It can lie dormant in the peripheral nervous system for years before erupting into a blistering rash that is often excruciatingly & unremittingly painful. The odds of developing shingles, if someone’s had chickenpox, are around 1 in 3 for those (like me) in the ‘older’ demographic, which is why I’ve had the ‘shingles’ vaccine (like all vaccines, not 100% effective, but better than nothing). Yes, prior to the varicella vaccine both chickenpox and shingles were effectively unavoidable – but why put a child at such high risk of future pain and discomfort now we have the means to avoid that? And while we’re talking discomfort – the chickenpox blisters can appear internally as well as externally, causing extreme discomfort. But hey, that’s transient! And claims to the contrary are clearly fake news. Chickenpox isn’t exactly benign, either. Infants, teens, adults, and those with compromised immune systems (eg due to chemotherapy or immunosupressant drugs) may be more seriously ill and be at high risk of complications. These complications can include bacterial infections, pneumonia, encephalitis, septicaemia, all of which may result in hospitalisation. 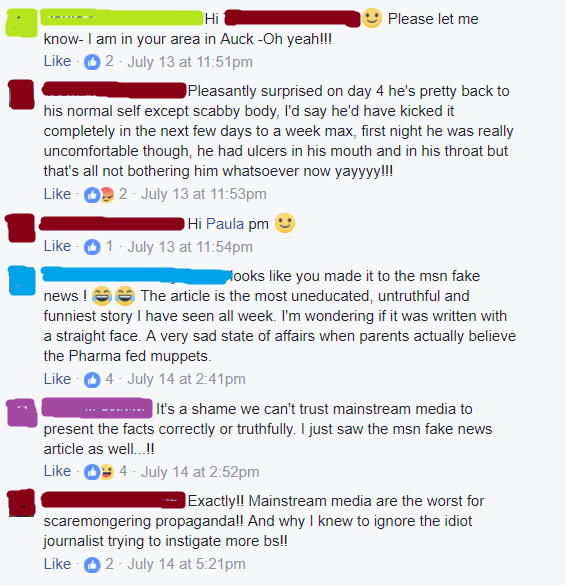 Despite claims on the “Bring Vaxxed…” page, infection of chickenpox blisters is not exactly rare: between November 2011 & October 2013 144 children were hospitalised with complications of chickenpox. Infections were found in 75% of cases. The median hospital stay was 4 days; 9% of those 144 ended up in intensive care, & up to 20% of cases had ongoing health issues after leaving hospital. Maori & Pacific Island children were overrepresented in these statistics. This information isn’t hard to find. And yet there are people, like those in the images above, who’d prefer to let their children run the risk of outcomes like these instead of use a vaccine with a high chance of conferring immunity (& so preventing shingles in later life). Not only that, they’ll happily ask about measles parties (Andrew Wakefield has a lot to answer for, in contributing to the myths around measles vaccination), and even discuss sending swabs from their child to others in Australia. I kid you not. 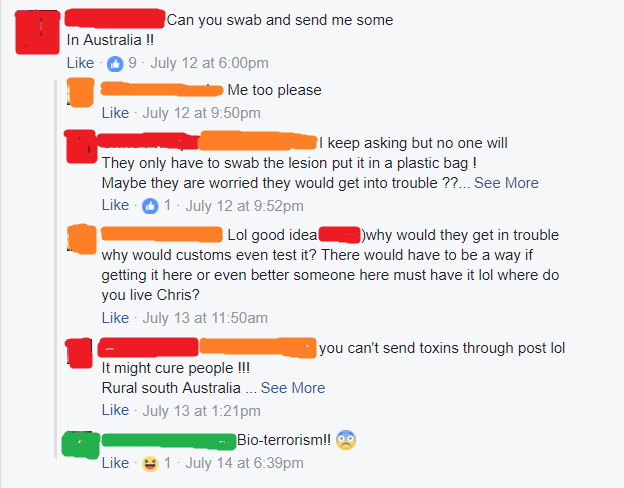 Are people really so wary of evidence-based medicine that they would rather ask someone they know only through the internet to send a swab of unknown provenance in the mail, in the hope of infecting their own child with goodness knows what? It appears that some are ? Featured image: Photo by Chris Lawton on Unsplash. I remember my sister having a German Measles party around 1960. Back then there was no alternative. I cannot understand why some people will happily use modern technology like computers to publicise mediaeval medicine.